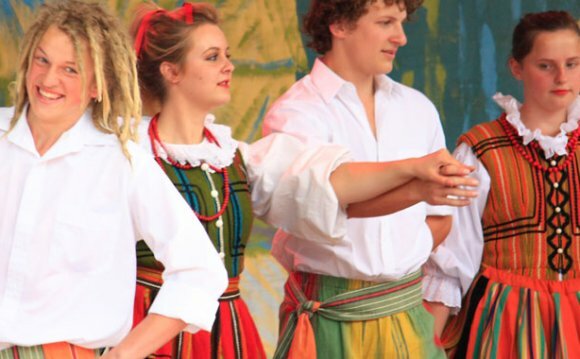 aims to "bring a taste of Poland to Melbourne", showcasing Polish culture, history and nationality at Federation Square in Melbourne's CBD. It is a not-for-profit event held under the auspices of the Polish Community Council of Victoria Inc (PCCV), and organised by a team of 10 volunteers. The last festival (November 2011) attracted an attendance of more than 60, 000 people, making it the second-largest cultural festival of its kind in Melbourne. The festival's focal point is Federation Square's main stage, where songs and dances are performed by schoolchildren, dance ensembles, solo musicians, bands and scout groups, interspersed with speeches and theatrical performances. A range of services and merchandise is sold at marquees around the main stage, while food stalls along the Yarra Terrace serve traditional Polish dishes, snacks and beverages. Visitors are also able to learn about Poland's culture and its contribution to Australian and world history through program guides distributed at the information stall. While the format of the festival has remained essentially unchanged since 2004, there have been a number of elements added over time to make the festival bigger and of broader appeal, particularly in relation to children and young adults. 2004 – In its first year, the Polish Festival was held at Melbourne's Immigration Museum on 12 September 2004. It was organised by the Immigration Museum in partnership with the PCCV, and was attended by 3, 000 people. 2005 – In 2005, the festival venue moved to Federation Square. Attendance swelled to some 25, 000 visitors, who were welcomed to the festival by Michael Klim, a Polish-born Australian Olympic swimmer, via a pre-recorded message screened above the main stage. 2007 – At the fourth festival, attendance grew to some 40, 000 people. This year saw the introduction of an official charity, in this case the Kassisi Children's Home in Zambia, for which the festival raised $585. Also introduced in 2007 was the KIDSTOP, a marquee on Yarra Terrace set up to provide Polish-themed activities for young children. 2008 – The associated Polish Film Festival commenced this year, with cinematic works from Poland screened at Federation Square's Australian Centre for the Moving Image (ACMI). 2009 – 2009 saw the first launch of the official Festival Afterparty, held at Transport Bar on Federation Square. 2010 – Fashion show incorporated into the afternoon programme, featuring garments by Polish designer Dorothy Jelonkiewicz.